When it comes to graphic novels or memoirs, I rarely ever read the back of the book or try to find out what the book is about. I am usually done with a graphic book within half an hour, and those 30 minutes either got wasted on a dud or spent with the most amazing comic book. Usually, it's the latter. If it's turning out to be the former, I tend to bail out very early. I am also usually indiscriminate with graphic books. As long as they are not part of a series or are not from the manga category, they find their way to my hands. However, when it came to Blue is the Warmest Color, I found myself ignoring that book. The cover art, as gorgeous as it is, didn't fascinate me for some reason. Plus, it kinda looked manga-ish to me. I know that's a stretch but who knows what the my brain sees when it looks at a picture. It was only after coming across a few articles / reviews recommending this book that I decided to give it a try. The 30 minutes I spent with this book turned out to be time very well-spent. 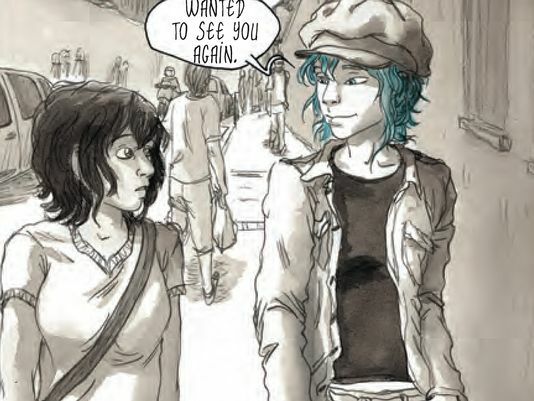 Blue is the Warmest Color is Clementine's coming out story and subsequent aftermath. Clem realizes that she likes girls when she sees Emma while crossing the road. Punkish and confident, Emma's blue hair stands out in any crowd. Very soon, they start an electric and wild relationship, which is however secret, because Emma already has a girlfriend while Clementine doesn't yet want the world to know that she is a lesbian. The facts however have a way of making themselves known and this seems to be bringing about an end to their relationship. The first word that came to mind after I read this book is "beautiful". That's how I would describe the artwork, the characters, and the story. There is much to love here. Emma's confidence and Clem's shyness ooze out of the book. Their love itself was wonderful to be lost in. Both girls are dealing with issues. Emma doesn't want to deal with rejection and not publicly acknowledging her love for Clem is her way of keeping the status quo. Clem is horrified by the reactions of her "friends" when they learn that she is gay, but this is just the beginning of her problems. Her parents are so anti-gay that it freaks her out. When the book begins, we already know that Clem is dead. The rest of the book is about how the two met and parted. As beautiful as this couple was, I did want to learn more about some of the auxiliary characters, such as Clem's parents and Emma's girlfriend. Their actions did much to sway the story in certain directions but not knowing much about the motivation behind what they did reduced their importance somewhat. They felt like pawns to me. I was also not a fan of the hasty ending, which reminded me of one too many melodramatic movies. I later learned that there is a movie based on this book and that the movie has been getting very rave reviews. I am not so sure I want to watch the movie, unless one of you can convince me otherwise. The book itself is very explicit and sexual in graphics, after all it a love story. The graphics are beautiful however - no matter what they are depicting. The font, the characters, the sketches - all contributed to the eye candy factor of the book.